Rewind a little, on the way home from the museum on Sunday, Daddy-ebi said that he felt like he was coming down with a cold, by the time we got home he was feeling rotten and was running a fever. The next day he was no better so off to the doctors he went, came back armed with about 17 different types of meds and went to bed. Yesterday he wasn't feeling any better and by lunch time his fever suddenly spiked, he couldn't feel his hands or feet and was short of breath, I can't drive so we called an ambulance. I was impressed that it only took them 7 minutes to arrive, we called an ambulance to a traffic accident a few years back and it took over 20 minutes for them to get there. 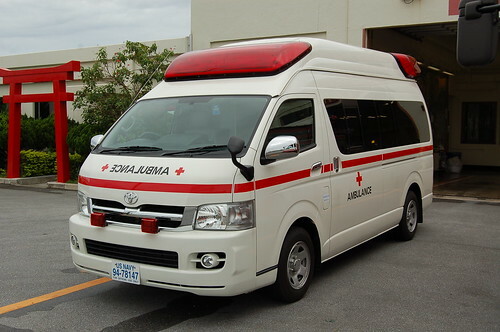 Most ambulances in Japan are only equipped for first aid and the ambulance staff are not paramedics, they do have paramedic ambulances but I think they must get sent out for specific cases. Anyway... they took us to the same clinic where he had been diagnosed with summer flu the day before, the doctor thought it was a calcium deficiency so they put him on a drip for 4 hours and his temperature dropped and he was feeling a bit better so he was released. This morning, he gets a phone call from a co-worker, there are 5 people who sit together in the same area in his office, four of the five are sick, one of them went to the hospital somewhere in Tokyo yesterday and was diagnosed with micro plasma pneumonia (not sure if that is the correct translation). Daddy-ebi is still running a fever so he has gone to the big hospital in town to get checked out. It is a bit scary all, this since daddy-ebi rarely gets sick and if he does it is just a bit of man-flu or self inflicted due to beer! Well, that was our excitement for the day, hope yours wasn't as exciting! Poor daddy. Hope its nothing too serious. Must be a shock to men when they actually do get quick sick. Hoping for a speedy recovery and no more ambulances. Did Ebi-kun get to ride in the ambulance? I think Shou would lose any worry for his father's well being if it meant he got to ride in an ambulance. yes, Ebi-kun came too which he thought was pretty cool but by the time we got home he was exhausted and really worried about daddy, even though he had been released! I hope its nothing serious and get well soon. What a shock that they are all sick. It must be the same thing..... Mycoplasma (???) I have heard can be quite severe so it's good that he's gone back to get checked out today. Presumably the quicker and harder they hit it the quicker Daddy Ebi will be back on his feet. It's very worrying when people who rarely get sick, well, get sick! Isn't it? I hope that Daddy-Ebi is on the mend by now and that you and Ebi-kun are Ok!